The June 2018 meeting of the Nashville Area Beekeepers Association will be held on Saturday June 9th starting at 9:30am (check in will begin at 8:30am). Note this is on a Saturday and not our normal meeting day of the second Sunday of each month. NABA family members are also invited, but not minor children. Members of other bee associations, as well as any interested person, are also cordially invited to attend. The event will be a “Field Day” with a number of hands-on “beekeeping teaching stations”, a BBQ lunch, door prizes, tours and live bluegrass music. Our host will be Trevor Qualls and Bon Aqua Springs Woodenware. The location is 10832 New Cut Off Road, Bon Aqua Springs, TN. In case of bad weather we will cancel the event 24 hours ahead of time. Station #1 Making Splits, Installing Nucs & Swarms and Basic Queen Rearing (Kent Williams) — The various aspects of making splits and the caring of newly established colonies, including splits, swarms, nucs and packages will be covered. Kent will also cover some basics of queen rearing and other advanced topics. Station #2 Hive Inspections (Barry Richards) —Barry will show you the gear you need to do a hive inspection. Then an active hive will be opened and inspected, showing proper techniques, what to look for and how to do basic manipulations. This will involve a live bee colony so a veil is required. Station #3 Shop Tour and Woodenware Assembly (Allen, Amy and Gail Qualls) The family will show all the shop production facilities at BAS, demonstrating key equipment used in making woodenware and how to assemble frames & hive bodies. You can also see the various types of products in inventory at BAS and learn how orders are processed. Station #4 Pest and Disease Management (Pat Walsh)—The main emphasis is on Varroa Mite control using the methods and techniques provided by the Honey Bee Health Coalition. Limited quantities of the HBHC guide for controlling mites will be available. Also discussed, as time permits, will be dealing with other pest problems. Station #5 How Do You Feed Bees (Mike Ireland & Lisa Swart) They will demonstrate hive-top feeders, entrance feeders, making fondant, winter feeding techniques, use of pollen for feeding and making syrup. Also discussed will be how to feed new colonies (nucs, swarm colonies and packages). Station #6 Equipment You Need & How to Prepare It (Carey & Petra Mitchell) — What do you need in terms of woodenware, protective clothing, other equipment and bees? 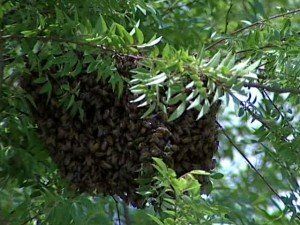 How do you prepare the hives? When and how to get started? Long term, what do you need after your colonies are established. Schedule—Those attending can choose what teaching stations to attend and in which order. There will be a break at around 11:45 for lunch, picking up orders and listening to music. The program will resume at 1:00pm. The day will end with a “wrap up get together” for all those attending. Invitees and Logistics—NABA members and their family members are invited free of charge. We will also be inviting members from local bee clubs in the area. Non-NABA members may participate for a cost of $10 that will allow them to bring immediate family members and get a one-year membership to NABA. Because of liability issues for BAS, we ask that minor children stay home. We suggest you bring lawn chairs, beekeeper protective clothing, sunscreen, bug spray and if you like, things to drink (non-alcoholic). You will be required to sign a personal injury waiver to protect BAS Woodenware. A copy of this document is attached for your review prior to the event. Meals—A barbeque will be held on site by “Smoke n Willies”. Meals (BBQ sandwich, BBQ plate, ribs, sides and drinks) will be sold at a reasonable cost. Attendees may also bring their own food and beverages; however, alcoholic beverages will not be permitted. Live Music—We will have live bluegrass music during lunch, performed by local musicians. And perhaps, a surprise guest. Advance Orders— You may place product orders directly with Bon Aqua Woodenware. Orders can also be placed for Bon Aqua Woodenware products ahead of time for pick up at Field Day. These orders must be placed before 5pm on June 7th at http://basprings.com/contact-us/ or by phone (931-670-6862). Door Prizes—Numerous door prizes will be provided by BAS Woodenware. Each person attending will get a free ticket for the door prize drawing. Hive Give Away—Kent Williams has been kind enough to donate four complete hives for this event, complete with bees !!!!! When checking in, you may purchase tickets for a chance to win one of these hives. Buy as many tickets as you like at a cost of $10.00 per ticket. Proceeds benefit educational activities run by NABA. Arrival and Check In—When you arrive, we ask that you park in the designated parking area. For those with walking disabilities, we will have a parking area closer to the event. Please check in at the Registration Tent. Here you will register, sign the waiver and purchase any “hive give away” tickets that you want. If you are not a current NABA member, fill out the application form and pay your $10 entry fee. You will also get an event program with a raffle ticket attached. Driving Directions— From most locations in Nashville allow at least 45 minutes to 1 hour travel time. We will also have directional signs out at key intersections. In the area of Percy Warner Park pick up highway 100 and travel southwest for about 22 miles. Then turn right on New Cut Off Road. Bear left at the fork in the road and go about another half mile. Parking and check-in for the NABA Field Day is on your right. From the intersection of I-440 and I-40 just west of downtown Nashville, travel 31 miles on I-40 West. Take Exit 176 onto I-840 East. Go 7 ½ miles on I-840 East. Merge onto Highway 100 West via Exit 7. Go 2 miles on Highway 100 West and then turn right on New Cut Off Road. Bear left at the fork in the road and go about another half mile. Parking and check-in for the NABA Field Day is on your right. From the Franklin area get on I-840 at the intersection with I-65 and go west. Travel west for 23 ½ miles on I-840 West, then take Exit 7 onto Highway 100 West. Go 2 miles on Highway 100 West and then turn right on New Cut Off Road. Bear left at the fork in the road and go about another half mile. Parking and check-in for the NABA Field Day is on your right.